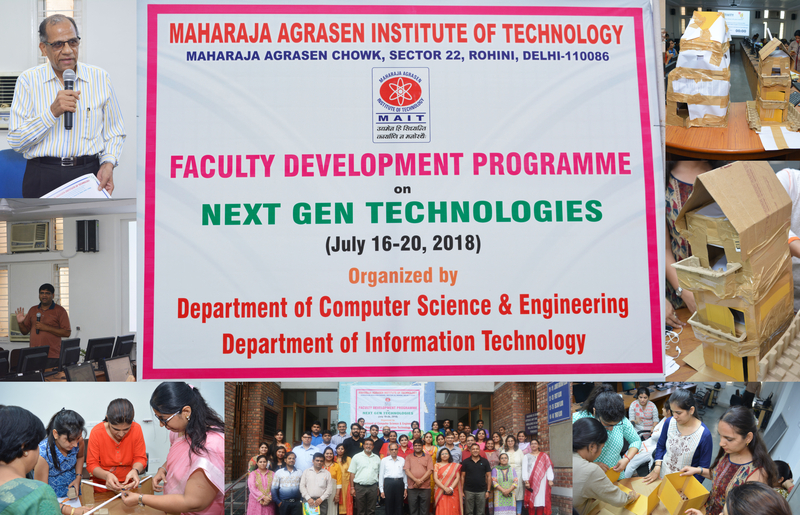 Technology, Maharaja Agrasen Institute of Technology, successfully organized a 5 Days FDP (Faculty Development Programme) on “Next Gen. Technologies” from July 16-20, 2018. Prof.(Dr.) M.L. Goyal, Director General, MAIT addressed the gathering with his highly knowledgeable ideas which he earned from corporate world during his stay in more than three decades and explained the utility of such FDP. Assistant Professor, Department of Information Technology conducted the hands-on workshop on different Modules of Java Programming for all faculty members of CSE and IT Departments. Earlier, both these faculty members already attended 15 days programme at Wipro Private Limited, Bangalore in April, 2018. Every faculty member of each department took interest in this hands-on workshop with great enthusiasm. Around 50 faculty members from both of the Departments of MAIT were benefitted with the conduction of this hands-on workshop. Ms. Vandana Choudhary, Assistant Professor, and Mr. Varun Goel, Assistant Professor, I.T. Department and Supporting staff members Mr. Sumit Gupta, Mr.
Anish Gupta and their teammates from CSE Department and Mr. Surender Bhardwaj and Mr. Gaurav Goel and their teammates from IT Department. Director General and Management for conduction of this workshop.